A Sunday Times Top Five Bestseller and chosen for the Waterstones Book Club 2014, Elizabeth is Missing is the stunning debut novel from author Emma Healey. Meet Maud. Maud is forgetful. She makes a cup of tea and doesn't remember to drink it. She goes to the shops and forgets why she went. Sometimes her home is unrecognizable - or her daughter Helen seems a total stranger. But there's one thing Maud is sure of: her friend Elizabeth is missing. The subject of a bidding war between nine publishers, Emma Healey’s debut novel became one of the most talked-about books of 2014. 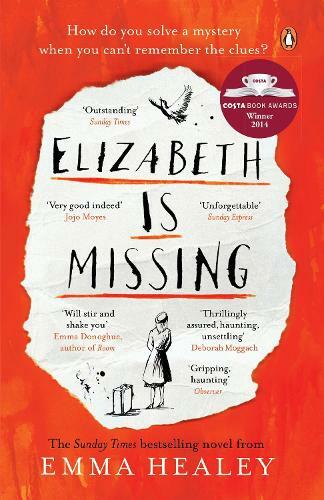 Described by the Independent as ‘an extraordinary tale of ordinary tragedy’ Elizabeth is Missing is a compelling mystery which – through its depiction of its confused 90 year old narrator Maud – walks sensitively through new imaginative territory. A moving, intriguing journey following the breadcrumbs of the past, it will keep you glued to every page.